Add-A-Stop For Toilet Connection contains 12-inch Stainless Steel flexible toilet supply combination with 3/4-inch female swivel inlet and 1/4-inch turn ball valve. It leaves old parts in place and doesn't disturb old joints by retro-fitting onto old adapter or ceased supply stop. The unique supply stop and stainless steel supply assembly eliminates one potential leak point and the 1/4-inch turn ball valve ensure reliable valve closure. Is a tremendous time saver, as water to the entire house no longer needs to be turned off in future toilet repairs. This 20 in. Click-Seal Faucet Connector features durable braided stainless-steel construction that remains flexible for easy installation. The new Click Seal technology means there are no need for tools, simply turn the Click Seal nut until it clicks and you have a secure seal. No leaks, no tools, no problem. This Click Seal connector fits 3/8 in. x 1/2 in. applications. Made from tough stainless steel wire, NO-BURST faucet connectors exceed all agency requirements for flexible water connectors. 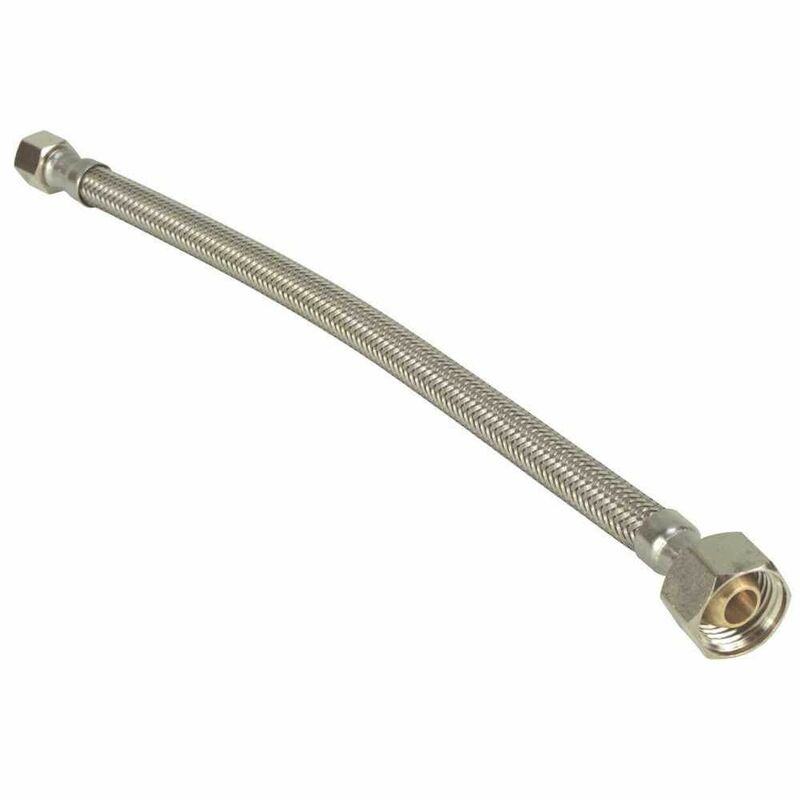 Every foot of this faucet connector supply line contains 220' of stainless steel wire, ensuring high bursting strength.^^Every fitting is secured in place with a special radial crimp, ensuring that your connector lasts. The connector's inner core has a large diameter to keep water flowing! This toilet tank connector exceeds all agency requirements for flexible water connectors. It's made from 220 ft. of stainless steel wire and features fittings that are secured in place with a special radial crimp.^^The 220 ft. of stainless steel wire ensures a high bursting strength, while the connector's large inner core diameter ensures water keeps flowing. These qualities help your connector last. Subscribe to Home Depot emails and get $5 off your next in-store purchase of $50 or more. Sorry, there was an error sending/recieving data.